I've just updated the HeroMachine 3 Alpha with a new "Standard" set for the "Hair" slot, replacing the former "HairMaleStandard". All of the items that used to be in the old one are in the new one too, starting on preview page three, I think it is. Let me know in the comments if there are any styles you were really hoping for that didn't make it, or if there are any changes you'd like to see made. Thanks for all of your earlier suggestions, they were very helpful in putting the group together! I’m sure you already know that some of the hair items are off location-wise. Other than that they look good. I would just suggest a long hair type that looks mroe like what Superman had when he had long hair (post-death of Superman). Also, a back note about the blades. They look great but you should create a hand for holding them because the hands currently look like they’re just in front of the item, not holding it. The tumb and stuff is in the way so it just needs tweaked like that. These are so great! You’ve outdone yourself. 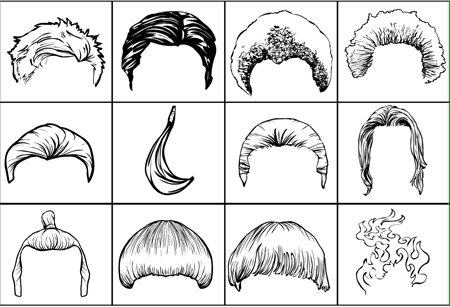 I can’t wait to start using the endless new variations on short male hairstyles. The bangs and extensions are also so incredibly perfect with the drag and drop feature. A formal updo along these lines (http://images.teamsugar.com/files/upl0/2/20652/08_2008/heidi.jpg), but made of braids. Padawan-type tiny braids to be added, to taste, if you include those as extensions. I tried to accomplish something similar in HM 2.5 and ended up getting a half-assed version by combining three different hairstyles. Hard to replicate stuff like that if you need to rework. @kryptkal: You have to mask the item onto the hand instead of having it pre-done like in HM2. Pick the hand you want, load the item you want, click Mask, and click the hand. The item now appears to be in the hand. Once again, progress is looking great. However, I’m curious to know if you have a place we can go to give suggestions/feedback that would be more efficient then just commenting on random articles. You’re always welcome to email me directly Andrew — afdstudios at gmail dot com, or you can use the “Contact Us” link up there in the header. Alternatively you can join and email the heromachine@yahoogroups.com list, though that’s not terribly active any more. The nice thing about doing this on the blog is that it’s sort of pre-organized. If I need input on a given slot and its items, I make a post on it asking for feedback and there it all is, in one big list. Plus it’s in the public domain so people can go and find info if they need it, versus it sitting on a YahooGroup. Also, you can go to the UGO HeroMachine Forums (link in the header) to talk about stuff there, though frankly I hardly ever go there. Except lately I’ve been checking the Hero Archives folder for new images, they’re pretty neat. Basically my brain is too small to keep track of multiple inputs. If mostly everything is in one place (i.e. the blog, which automatically dumps all comments into GMail for me), I can keep up a lot better than having to remember to check the email list, plus the blog, plus the other email list, plus the forums. They are very good Jeff, you added some hair strand. I’m glad. I’ll do like in 2.x collex and have a separate “HairFeminine” set. These are male and unisex. There are a lot of pony tails and some buns at the end though that are definitely female. Bloody heck! The hairsute gawds *have* looked down favorably upon thee!! Looks great love the seperate superman curl ect. Until I read your last comment about the “HairFeminine” Set, I was going to ask for a (near) exact replica of one long hair item. Give me one second to post it. @violodion: Ooo, that looks neat! It makes me all twitchy and eager to do the Hand-Energy set. Will you planned an Hair—fantasy set with tentacles, bony plates and other weird stuff. Nicely done on the hair options. I combined a few to get these results. By the way I know you’re finished with the belts but I really liked to look of what I added for a belt here. You might want to consider adding something like this. Oh yah, and over the shoulder sashes as well. Here are a couple other hair combos I used plus one pencil drawing I did for hair that might help offer some inspiration.